The award-winning Keystone Group is divesting the freehold of its Kings Cross icon, the four-level Sugarmill Hotel, at 33 Darlinghurst Rd. 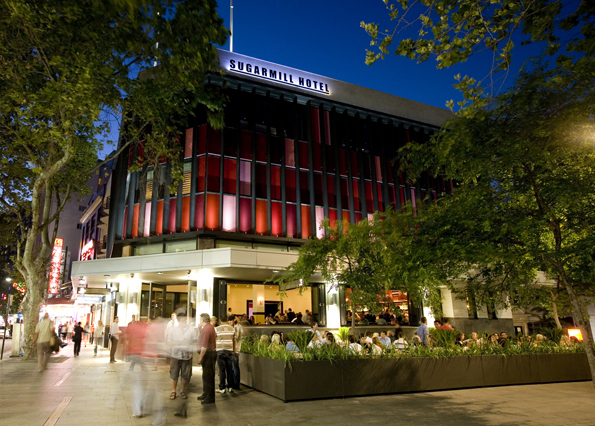 Expected to fetch around $20 million, the immensely successful ground floor bar, two levels of Kit & Kaboodle nightclub, and Sweethearts rooftop bar will stay tenanted by Keystone. One of the landmark venues on Darlinghurst Road’s “the strip” it has no doubt suffered from the controversial restrictions on the Kings Cross precinct, most severely the 1:30 lockouts that have turned Sydney’s late-night entertainment zone into a ghost town by 2am. It is the latest in a continued trend of sale and lease-backs made fashionable in recent years by ALH, which has freed up hundreds of millions of dollars in capital – much of it used to fund operational expansions. The concept was executed impressively at nearby Double Bay’s Golden Sheaf, with Solotel selling the bricks and mortar for around $43 million at a 6.5 per cent yield to a property investor through JLL Hotels and CBRE. The Sugarmill building is being marketed through JLL Hotels and Colliers International. JLL national director – pub investment sales, John Musca, says the freehold sale concept is becoming more acceptable amongst publicans. “When operators in any asset class seek to liberate dormant capital for brand expansion nationally, in a low interest rate extremely receptive trading environment, investors seeking annuity incomes will ultimately benefit,” Mr Musca said. The Surry Hills building housing Keystone’s Winery Bar recently sold for around $50 million at a seven per cent yield, and the Gazebo freehold on Elizabeth Bay Rd, with a long lease to Keystone’s Gazebo Wine Garden, is currently on the market by private owners. And Musca reports to PubTIC that Chris Cheung’s The Bourbon, set to close its doors for good in the near future, is currently under offer to a developer.